When Louisville is mentioned several topics can run through your mind; the Kentucky Derby, bourbon, Louisville Slugger, the University of Louisville, bluegrass in the city parks, southern cooking, and last but certainly not least, the amazing natives from the great state of Kentucky. One word that doesn’t immediately come into your mind is beauty. If you take a step backward and think of each place, thing, or memory of any I listed you can relate beauty to all of them. From the beautiful horses that grace the racetrack at Churchill Downs to the talented natives of Louisville, you’ll be able to tell me several beautiful details of many, if not all of my examples. It’s not only an attractive environment we all live in, but it is a creative nest for so many artists of various magnitudes which make our city a more beautiful place to eat, live, and play. 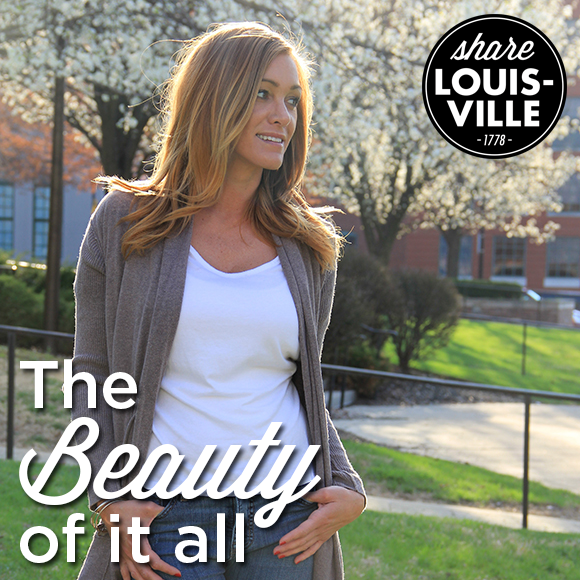 I am a writer, blogger, and beauty admirer here in Louisville. I love sharing images on and stories about women, men and what they do to help keep themselves and / or this city going. In my future blogs for Share Louisville I will share stories about local products and fashion items that can be found locally. And if you haven’t guessed yet, I’m sure you can figure out that I’m going to tie in how each of them is uniquely beautiful. Beauty can be found anywhere when you look for it and I can’t wait to share all I find with you. Thanks for taking the time to read my first post!